The Text of the Gospels: Fortunatianus Speaks! Fortunatianus’ Latin commentary on the Gospels, written c. 350 – about the same time as the production of Codex Sinaiticus, “The world’s oldest Bible” – has been found, edited, and translated! The announcement of its discovery by Dr. Lukas Dorfbauer in 2012 is old news to regular readers; that was mentioned here a couple of years ago, and Roger Pearse had spread the news about it before that. But now its text has been thoroughly studied and edited, and it has been translated into English. Dr. Hugh Houghton tells about what has been done with the commentary of Fortunatianus since its rediscovery in an article at The Birmingham Brief. ● Matthew 13:55 (or Mark 6:3) – Fortunatianus reads “Is this not the son of Joseph the craftsman [or, carpenter],” thus adding Joseph’s name. ● Matthew 9:13 – Fortunatianus reads “to repentance,” agreeing with the majority of manuscripts and disagreeing with the Alexandrian base-text of the ESV, NIV, NLT, etc. ● Matthew 16:2-3 – Fortunatianus confirms the inclusion of all of these two verses. ● Matthew 20:28 – Fortunatianus uses a text which, like Codex Bezae, contains a brief passage at this point resembling Luke 14:8-10. ● Matthew 24:36 – Fortunatianus’ text includes “or the Son,” and he expounds upon this reading in his commentary, proposing that this statement should not be taken literally. ● John 1:28 – Fortunatianus reads “Bethany,” but – echoing Origen somewhat – he proposes that “Here, then, we find a mistake either of the Latin translator of the copyists.” And he proceeds to mention that “Bethara” (rather than Bethabara) is the “house of preparation,” and is the name of the place where John began to baptize. Before describing the commentary, a brief description of Aquileia may be helpful. 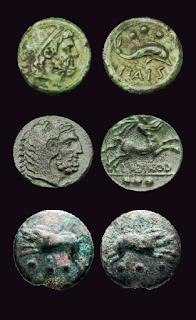 During the time when Fortunatianus served as its bishop, the city of Aquileia, along the coast of the northeastern corner of Italy (on a modern map, northeast of Venice and northwest of Trieste), was one of the most prominent and prosperous cities of the Roman Empire. An imperial palace was among its buildings, and Constantine himself visited there, and in 340, Constantine II was killed near the city. It remained one of the empire’s finest cities until it was attacked and destroyed by the Huns in 452. What Book Does Fortunatianus Comment on the Most? Fortunatianus focused mainly on the Gospel of Matthew. His method of commenting is far from systematic or exhaustive. 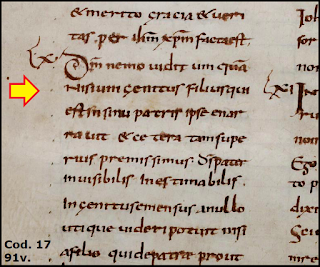 Those who approach this Latin text – which is extant, mostly, in a manuscript which can be viewed page by page at the Codices Electronici Ecclesiae Coloniensis (CEEC) website – expecting a verse-by-verse analysis of all four Gospels will be disappointed. Fortunatianus’ main focus is the Gospel of Matthew. He spends hardly any time on the Gospel of Mark, and although he covers John chapter 1 very thoroughly, most of John’s Gospel receives only spotty attention. The episodes in Luke which are not repeated in the Gospel of Matthew receive some attention from Fortunatianus; almost all the rest is set aside. In addition, except for parenthetical uses, the chapters which one might assume would be a commentary’s zenith – those about Christ’s crucifixion and resurrection – do not receive close attention. Does Fortunatianus Use John 7:53-8:11 or Mark 16:9-20? Fortunatianus gives no hint that he is aware of the pericope adulterae, but this should not be overplayed: Fortunatianus only used a single verse from John 6, and a single verse from John 7, and four verses from John 8, none from John 9, and two from John 10, and none from John 11. We do not therefore conclude that Fortunatianus was unaware of the healing of the man who was born blind, or of the resurrection of Lazarus. Fortunatianus’ sequential, focused commentary on the Gospel of John stops after his description of Jesus’ first miracle. After John 2:11, the rest of Fortunatianus’ utilizations of passages from the Gospel of John are fairly random and sporadic, not systematic. How Does Fortunatianus Organize the Text? Fortunatianus begins his commentary with a summary of each Gospel’s thematic emphasis, metaphorically expressed as one of the faces of the cherubim (Matthew as a man, Luke as an ox, Mark as an eagle, and John as a lion) and as one of the rivers of Eden. Fortunatianus proceeds to build an allegorical case for the inevitability that the apostolic gospel should be fourfold, arguing that a divine pattern, in which the gospel of the twelve apostles is displayed in four parts, is shown in the high priest’s breastplate (which had three rows of four gemstones) and in the shape of a walnut shell, and via various typologies in the Old Testament. He then shifts directly into a interpretation of the first two chapters of Matthew, offering reasons why Matthew’s genealogy and Luke’s genealogy go in different chronological directions, and why Matthew mentions 42 generations but only names 41, and why Matthew 1:25 does not imply that Joseph and Mary were intimate, and so forth. After finishing his comments on Matthew 1-2, Fortunatianus introduces a list of the sections of each Gospel which he proposes to interpret: 129 sections from Matthew (consisting of material from 1:17 to 27:51), thirteen sections from Luke (consisting of material from 2:1 to 5:12 (or 5:16, where the episode concludes)), and 18 sections from John (consisting of material from 1:1 to 2:11). Fortunatianus mentions that he will also comment on a few things that the other Gospels do not cover. Having this established the borders of the territory to be explored, he proceeds. What Kind of Interpretation Does Fortunatianus Give? While Fortunatianus does not deny the historicity of the reports of events in the Gospels, he consistently interprets them so as to convey a spiritual, typological, or allegorical lesson; as he says in the course of commenting on Matthew 15: “Even though we can see that these were fulfilled on a literal level, they also have a spiritual meaning” – and this spiritual meaning is his constant quarry. Modern commentators of all theological persuasions may chuckle at the notion that the true lesson of Jesus’ statement in Matthew 5:26 is about the necessity of belief in the Trinity. 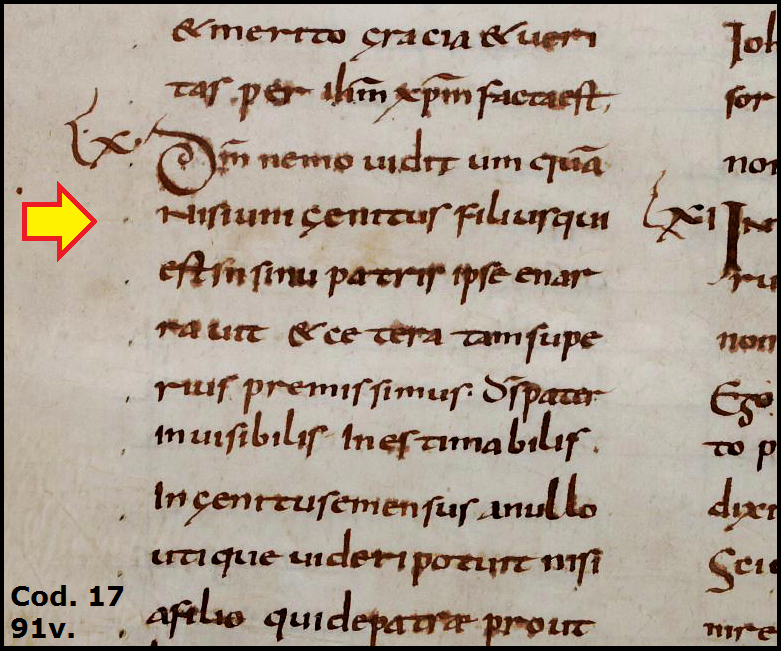 And yet, while we may prefer historically grounded commentaries, how many historically grounded commentaries have you read that mentioned the dots on a quadrans? 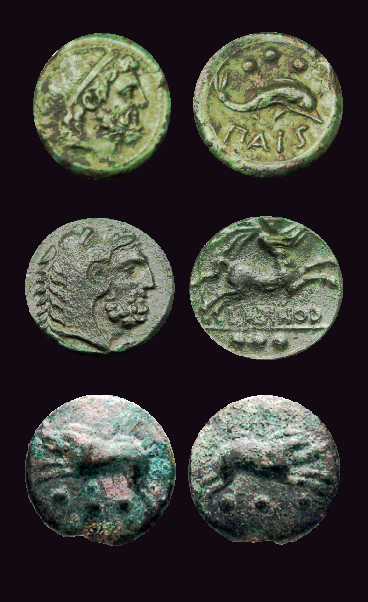 Occasionally Fortunatianus shares genuinely interesting data-nuggets, and makes some edifying connections. However, most of what he sees requires some extreme squinting. Commenting on Matthew 15:28, where Jesus addresses the foreign woman with the words, “O woman,” Fortunatianus perceives that Jesus’ answer began with the letter Ω (that is, in Greek, omega), and that because omega is the last letter of the Greek alphabet, this signifies that it is in the last days that the church has believed in the Son of God, and given Him his due worship. Fortunatianus described the Septuagint with approval; he quoted Habakkuk 3:2 with its distinct reading; he utilized passages from Ecclesiasticus, Baruch, the Letter of Jeremiah, and Susanna. This shows that he recognized an Old Testament canon broader than the 39-book canon; yet it cannot be safely assumed that he regarded texts such as First and Second Macabees as authoritative. Fortunatianus utilized passages from Matthew, Mark, Luke, John, Acts, Romans, First Corinthians, Second Corinthians, Galatians, Ephesians, Philippians, Colossians, First Thessalonians, Second Thessalonians, First Timothy, Second Timothy, Titus, First John, and Revelation. It is plausible that he simply did not have an occasion to quote from Philemon, Second John, Third John, and Jude – but the lack of quotations from Hebrews is interesting. Fortunatianus took for granted the authority of Revelation, citing its contents 14 times. What Theology Does Fortunatianus Promote? Fortunatianus seems like a complete stranger to the tradition about the dormition of Mary, expressing a belief that Mary was put to death with a sword, as suggested by the prophecy of Simeon in Luke 2:35. Another unusual belief to which he subscribes is that the John, though included among the twelve apostles, was quite young during Jesus’ ministry – young enough to be the little child mentioned in Matthew 18:2-4. How Can Fortunatianus’ Commentary Be Accessed? 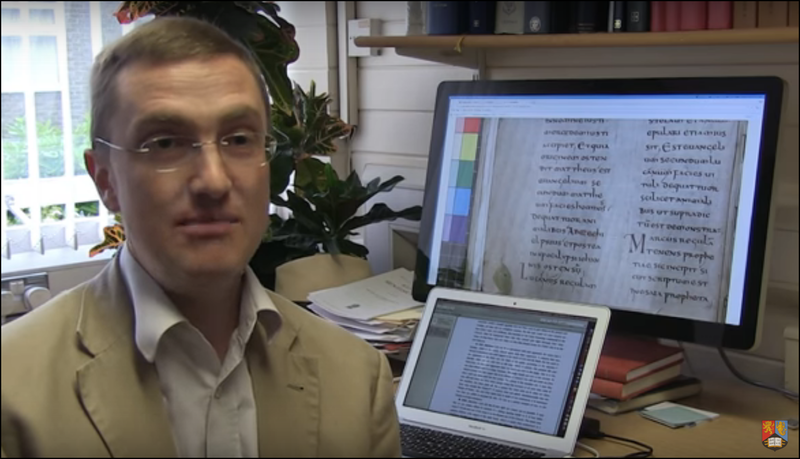 Fortunatianus' commentary in a short video. 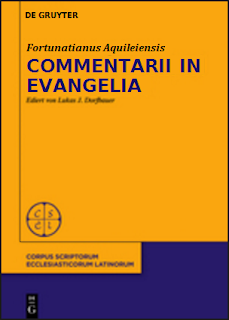 DeGruyter has released Dr. Lukas Dorfbauer’s critical edition of Fortunatianus’ commentary on the Gospels as Volume 103 in the Corpus Scriptorum Ecclesiasticorum Latinorum series. It is currently priced at $114.99 and is described as “of extraordinary significance for patristics.” A most welcome item for academic libraries. A volume containing analytical essays about Fortunatianus’ work is also available. 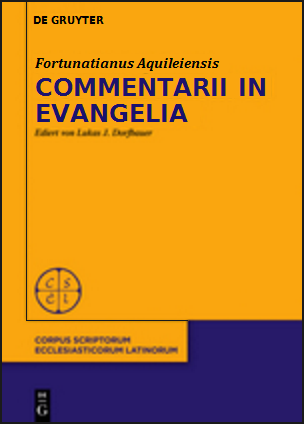 Dr. Hugh Houghton has completed an English translation of Fortunatianus’ commentary. The translation is also distributed by DeGruyter, and hardcover copies of it may be purchased for $68.99. The English translation was part of a project funded by the European Research Council, and its funds also made possible the provision of digital versions of Dr. Houghton’s English translation of Fortunatianus’ commentary on the Gospels which are available to download for free in Open Access via a series of links at their website (just scroll down a bit on that page to see the links). Thank you to all concerned, and congratulations to Dr. Dorfbauer and Dr. Houghton upon the completion of this important work! Thanks for this, James. Very helpful. For a second I thought that was Peter J. Williams whose article on Premier Christianity you linked to, but it is Peter D. Williams.